At first glance, Rocket League may seem like a simple and informal game, but if you spend time, you will find that it is far from the case. Rocket League has a very high skill level requirement if you want to reach the top, you want to make the most of it. 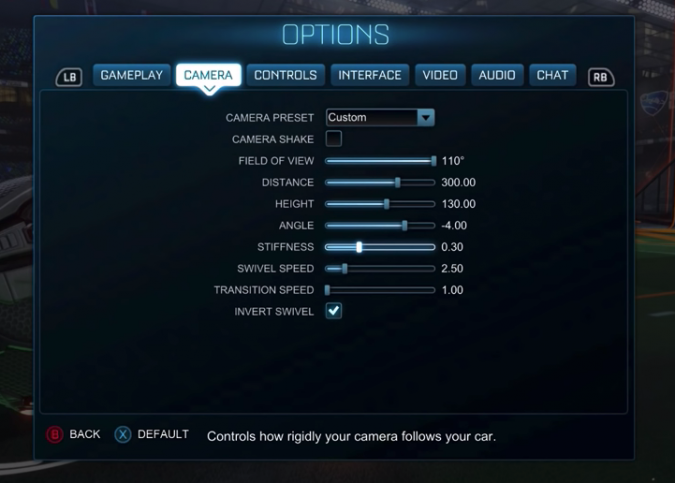 This Rocket League camera settings guide should help improve your game. With the optimal configuration of the Rocket League camera, you can control your car as accurately as possible. This guide will help you improve the game to get the best possible performance. We have analyzed lots of professional Rocket League players on our list of Rocket League camera settings professionals to provide you with an easy way to customize your settings. The camera settings of Rocket League are very important as they can dramatically change the gaming experience. However, instead of blindly copying your favorite professional gamer settings, it is important to find the right settings here. But it is said. It is recommended that you use the settings used by our experts as a starting point for setting your own camera view. The higher the field of view, the easier it is to see the playground. Of course, you are at a disadvantage if you cannot see your car and the ball in the game, you also to have a good overview of the terrain. Therefore, most experts choose to maximize this parameter. Each expert we surveyed has no FOV of less than 100. This shows that at the highest level, a good perspective is very important. Go for a wide field look. It’s probably better to imitate this because you do not want to be penalized by less ground than your opponent. Camera Shake is disabled by all the experts we have analyzed. In fact, the camera moves a bit to simulate speed and chaos. This makes the game more intense and may be a good idea for story-based games, but it makes no sense in competitive environments. Disable camera shake for a more neutral and clearer experience as your vision is always as clear as possible and you want to eliminate all sorts of distractions. This is the actual distance between your car and the camera. This is one of those settings that suits personal preference. The greater the distance the camera is, the better the view of the ball and your surroundings. A large distance generally improves the overview. Choosing the option that suits you is up to you, but experts usually agree within a certain distance range. Therefore, it is helpful to select settings from the pros. The average distance used by experts is around 270. Make sure you know the pros and cons of long-distance / short-distance and play with this setting until you find the best option for you. This setting changes the height of the camera. Although I understand the benefit, there is the potential for problems with setting the camera on a high viewpoint. It is therefore difficult to judge whether the camera is at the same height as the ball in the air. In terms of height, this parameter is mainly based on preference, but the experts seem to agree with a level between 100 and 130, the average being about 110. Basically, it means how much the camera is “loose” when you follow your car. In the lowest setting, the camera will zoom very fast at very high speed. Or “hang” by sliding behind the car. The higher the value set, the easier it will be to follow the movement of the vehicle. An easy way to visualize this configuration is to imagine a camera following your car. In the lowest configuration, imagine this camera was attached by a long spring so you can follow your car smoothly and see all four sides at times. The higher setting is like having the camera attached by an iron bar. The camera stays in a fixed point. Experts use an average rigidity of 0.43 cameras. This setting changes the camera’s view of your vehicle. Pros don’t often go for the birds eye view, but wont to optimize it to see enough terrain as possible. This will allow you to choose whether to hold down the button that activates the ball cam (return to the vehicle camera when the button is released) or to just activate it. Although this is preferred, be careful that you do not have to worry about pressing the button with your fingers during complicated operations. Most people choose to toggle the ball cam rather than holding the button. It’s essentially the “sensitivity” of your camera. That depends on how fast your camera should swivel when in use. Some people prefer to bend very quickly so they can see as quickly as possible, others want to slow it down to better control where they turn. Both sides have arguments. Therefore, you should try this out and use the optimal parameters for yourself. for reference. Experts use an average of 5.3. The dead zone of the controller is a parameter for adjusting the sensitivity of the button. That is, if you exceed the “dead zone”, the movement is recorded by the stick. The lower this parameter is, the more sensitive it is. Most professionals in the Rocket League seem to use the range of 0.05 (= 5%) to 0.15 (= 15%) with normal outliers. Playing with the lower players makes playing very difficult. Therefore, we recommend starting with 0.15. This parameter is probably the most important. However, if the vibration setting of the controller is activated, the life of the battery will be shortened. But for most people, this is a distraction you do not want in competitive games. Although it has the least impact on the game, this is not a big deal and we recommend disabling it. Overall, there are two parameters that give most people a competitive edge, FOV and camera shake. Other parameters are mainly based on preferences, but experts usually keep within certain parameters. If all the experts agree, there should be something. Overall, it’s better to use it as a guide. The setting is personal (like other games) and if it works for you it’s wonderful if it does not work for all.